The cast of ‘Accidental Pilgrim.’ Photo provided by Theatre Du Jour. Life is unpredictable. Very few people end up where they thought or got there the way they planned. It is little things that change our course. 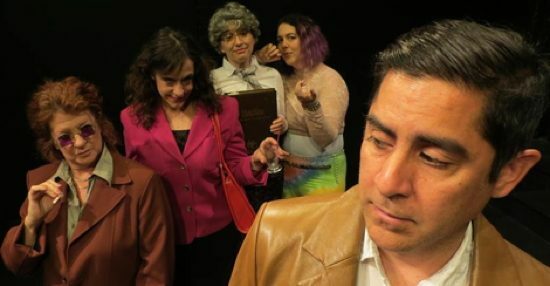 Theatre Du Jour’s latest devised piece “The Accidental Pilgrim” addresses just that through its vivid multimedia and movement driven piece at the Capital Fringe Festival. Director B. Stanley writes in the director’s note though that the piece can mean whatever it is meant to mean to each individual audience member. …a fascinating exploration piece, perfect for those interested in something a bit nontraditional and artsy. The ensemble consists of Rachel Reed, Anetta Dexter Sawyer, Kris Roth, Jerry Herbilla, and Jacquelyn Paulin. These five actors work together to create this elusive world somewhere between a train station and an open field. Most of the actors played multiple characters. They use wonderful physical storytelling techniques with each scene feeling more like a movement piece. There is very little dialogue throughout the show and scenes are interspersed with video and music by sound designers Rob Gould and Nate Taylor. We meet a man waiting for a train and he hears different opinions about his destination from others there. He might be looking for “it” but maybe he won’t find it where he is going. As the eerie person sweeping the floor tell him, people seem to be caught up about where they are going without thinking about what direction they are going. Suddenly things change and maybe he will or will not end up where he thought. Stanley’s direction allows for impactful moments of silence and stillness. It is difficult to accomplish this without halting the pace of the story but in this case, it was done remarkably well. Those moments allowed the audience to process and develop their own interpretation of the story. Stanley also designed this piece. It had an open set with a large brick wall and a bench. The costumes were delightful (also Stanley), mostly muted colors with a few exceptions to really distinguish characters. The end has a powerful and surreal design choice that is a fascinating representation of our experiences. “The Accidental Pilgrim” is a fascinating exploration piece, perfect for those interested in something a bit nontraditional and artsy.